Last week, I was out grocery shopping with my bf at Hypermart MGK. It has recently become one of my favorite supermarket since it's located near my house, has almost everything (except for drugstore makeup, booooo....) and also sells freshly baked bread. As I was strolling along the body lotion aisle, I stumbled on this lotion from Vivelle. I've used Vivelle's body mist since I was in high school and have been loving it a lot. So, I thought I would give this a try to see if it's worth the money for a drugstore/supermarket brand. If you're interested in my review, then keep on reading ^^. Virgin Coconut Oil is unlike any other coconut oil. It is proven to absorb deep into the skin to moisturize and smooth out the skin. It also contains Vitamin C to brighten the skin. Feel the difference after using it! Skin feels moisturized, smooth and not greasy. Use on skin every day to maintain beautiful skin, especially on the dry areas such as the elbows, heels and knees. I squeeze out a 3 cm diameter and applied it to my arm. I'll repeat the same process for the other arm and legs. It blends nicely, giving a dewy finish to my skin. It's available in most supermarket here in Jakarta. I saw one in Sogo Food Hall Kelapa Gading as well. The price is very, very affordable at IDR 13,500 (prices may vary at different supermarkets). There are three versions of this product. 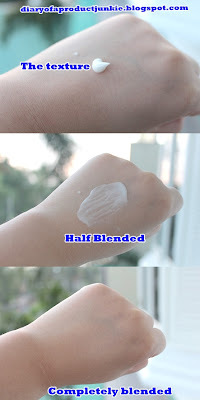 For normal skin, dry skin, and very dry skin. I got mine in dry skin. The packaging is very well thought of. The opening of the cap is located at the bottom when it is placed vertically. This way, the product will always come down as gravity intended them to, so I won’t have to wait forever when it is running out. A flip cap. Just love it. The ingredients are all safe and don’t contain mineral oil, despite the cheap price. Usually, cheap body lotions at the supermarket aisle contain mineral oil as one of their ingredients. It has a citrus-y scent that smells fresh. It gets absorbed by my skin quite fast. It doesn’t leave a greasy finish. It moisturizes my skin for around 6 hours. Afterwards, I need to reapply to have a moisturized skin. It doesn't contain any sunscreen ingredients. It only comes in one size. It would have been nice to have a bigger packaging with pump like Vaseline’s. Even though I like the scent, but I wish they would've just eliminated the scent so people with sensitive skin has a higher chances of not developing a reaction when trying this on.